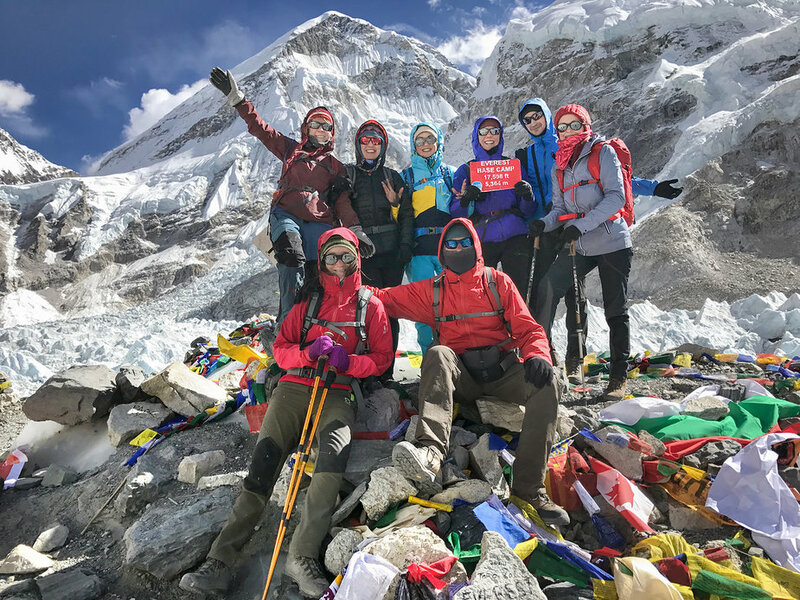 Three High Passes of Everest Trekking, an adventure that leads you above 5,000 m passes with mind-blowing views of mountains and fabulous landscapes with unforgettable memorable and daring experience that lasts for a lifetime on this great exciting adventurous journey. 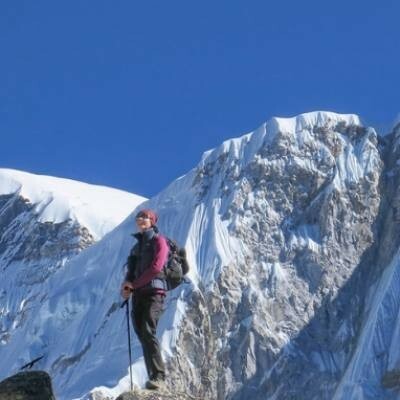 Truly one of the most tough and high adventure with exciting times during the whole trips overlooking exceptional views that never seen on normal trekking, where you will have great opportunity on this marvelous and tough trek in the hidden corners of Everest region around high Khumbu. 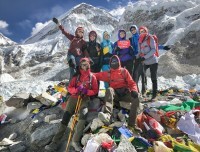 Three High Passes of Everest Trekking, an adventure for daring trekkers and adventurer with great interest in pure wilderness trekking that leads you away from main flow of trekkers and human settlement for some days in the harmony of serene natural environment with only the sound of winds and crackling glaciers and snows. 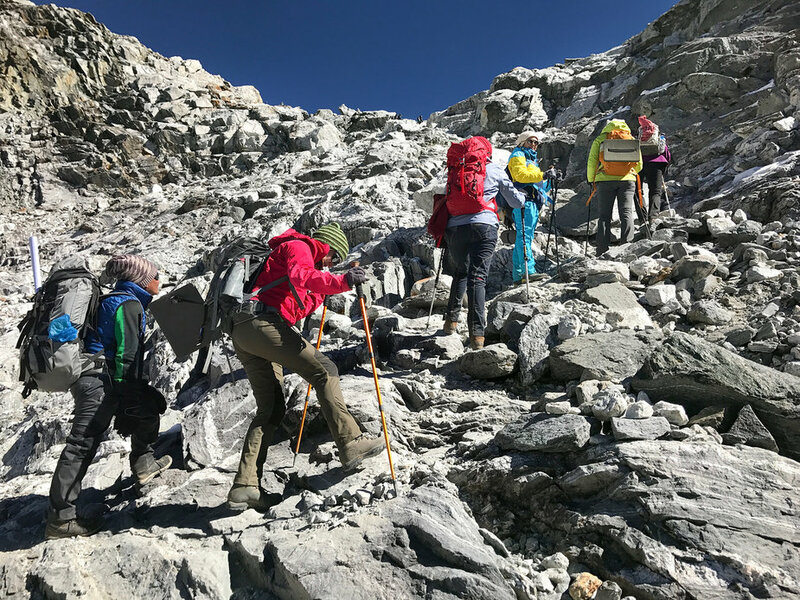 For this trek one should be in sound health and physical fitness to encounter tough challenge as per our itinerary days, which sometimes can get changed due to bad unfavorable weather conditions of heavy snows or broken trails from landslides and avalanches. With our expert guides will do our best making this trip an enjoyable and safe which you can rely on with our safety measures of high quality services including guides and strong cheerful porters to accompany you. Walk starts from Sherpa town at Lukla after landing taking a flight from Kathmandu, as adventure begins on scenic moderate trails encountering many nice villages to reach high above Namche Bazaar, with rest day for acclimatization and then heading on towards our main goal to cross the Kongma-la and to Everest base camp with climb of high Kalapatthar. Adventure continues towards Tsho (Cho)-la second pass to reach beautiful Gokyo valley and its simmering lakes where a climb leads to Gokyo Ri for breath-taking panorama of worlds four highest mountains with Everest-Lhotse, Cho-Oyu and Mt. Makalu. Completing our fantastic adventure crossing the last final pass over Renjo-la which leads you to Thame village and then to Namche Bazaar, as walk leads to our final ending point at Lukla where a scenic flight brings you back at Kathmandu with outmost and remarkable adventurous time on Three High Passes of Everest. 1 Day 1: On arrival in Kathmandu meet our staff for transfer to hotel.On arrival at Kathmandu Tribhuwan International Airport received by our staff and guide with warm welcome and greetings and then transfer to your hotels in the heart of Kathmandu city. After checking into your rooms getting refreshed from Jet-Lag, a quiet environment after getting refreshed join at main hall or in lobby where our guide will provide briefing on treks-hotels with necessary information. Evening includes group dinner in a typical Nepali restaurant with folk culture program with various dances of Nepal while having your authentic Nepalese dinner with local entertainment. 2 Day 2: In Kathmandu with sightseeing tour around world heritage sites.Morning after hearty breakfast depart from the hotel where our city and tour guide leads you for exciting guided sightseeing around Kathmandu. Although Kathmandu a metropolitan city still retains its ancient culture and traditional way of life with many world heritage sites to visit of great interest, tour of Kathmandu Durbar Square (old Palace courtyard) old Syambhunath Stupa (famous land mark of Nepal and Kathmandu), Bouddhanath Stupa (Little Tibet) with holy Pashupatinath Temple of Hindu religion and then back to hotel with time for Three High Passes of Everest trekking preparations. 3 Day 3: Fly to Lukla 2,820 m (30 mins flights) and trek to Phakding 2,640 m - 03 hrs.Early morning transfer to Kathmandu domestic airport for super short flight to land at Lukla, the gateway to many adventures around Khumbu region, where walk starts on gradual winding path past several Sherpa farm villages with views of Kongde and Kusum-Khanguru to reach overnight stop at Phakding, located by the glacial Dudh Kosi Rivers. 4 Day 4: Trek to Namche Bazaar 3,440 m - 06 hrs.Today walk leads to Namche Bazaar gaining altitude as walk progress, morning walk starts following the river and crossing several times to reach at Monjo village near Sagarmatha National Park entrance, from here walking on river valley and gorge covered within nice woodland of tall rhododendron-pines and fir trees. After crossing a high last bridge with few hours climb to Namche Bazaar with stunning views of Everest-Lhotse and Kongde peaks. Namche Bazaar at 4,440 m high an ideal place for rest day to acclimatize, the main town / village of Khumbu where colorful and exciting Saturday market takes place once a week. 5 Day 5: Rest day at Namche Bazaar for acclimatization and excursion.Rest day for acclimatization before heading higher terrain, morning after breakfast with options for hike to Everest View Hotel or walk on top of Namche, where you can catch super landscapes scenery with Mt. 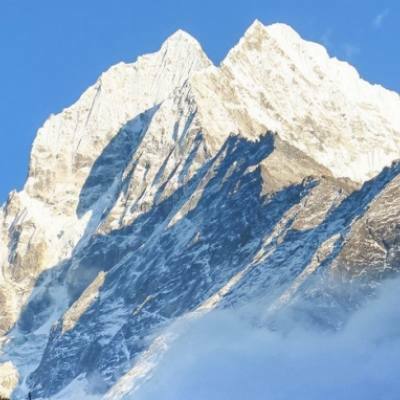 Everest, Lhotse, Ama Dablam with series of high peaks, here enjoy visiting National Park Museum provides you with much information of Khumbu region, Sherpa history-culture-flora and fauna including detail on mountaineering. 6 Day 6: Trek to Thyangboche Monastery 3,867 m - 05 hrs.Enjoying pleasant time at Namche, morning walk leads to scenic and gradual walks overlooking Everest and other giant peaks, as our route leads downhill to Imjatse river at Phunki Tenga, a small place with few lodges an ideal spot for refreshing break or lunch stop. 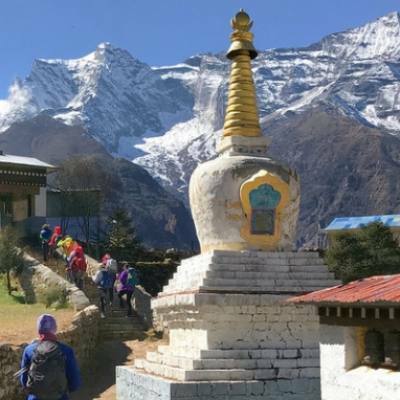 From here uphill climb into enchanting alpine forest to reach a beautiful surrounding at Thyangboche Monastery with grand panorama of mountains with Everest and Ama Dablam with time for tour into monastery and witness monks and priest on prayer. Thyangboche also holds colorful festival ‘Mani-Rimdu’ monks with mask dancing wading evil spirits which falls in the month of October as per Buddhist lunar calendar. 7 Day 7: Trek to Dingboche 4,260 m - 05hrs.Morning catching super views of high peaks with Everest, our route descends into forested areas reaching a metal bridge, from here a slow climb encountering mani (prayer) walls along the walks to Pangboche village, this is a last Sherpa permanent village on route to Everest base camp. Other places are temporary settlements with fine lodges to cater the needs of travelers and trekkers, as walk continues heading higher, from here walk leads on barren and arid country where tree lines drops for small bushes of juniper and dwarf rhododendron (azalea). 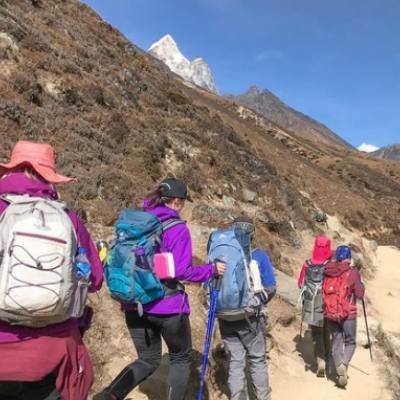 Walking uphill into a river gorge and then finally opens up into a wide glacial valley on reaching Dingboche With many good lodges around facing views of Imjatse or Island peaks towards east. 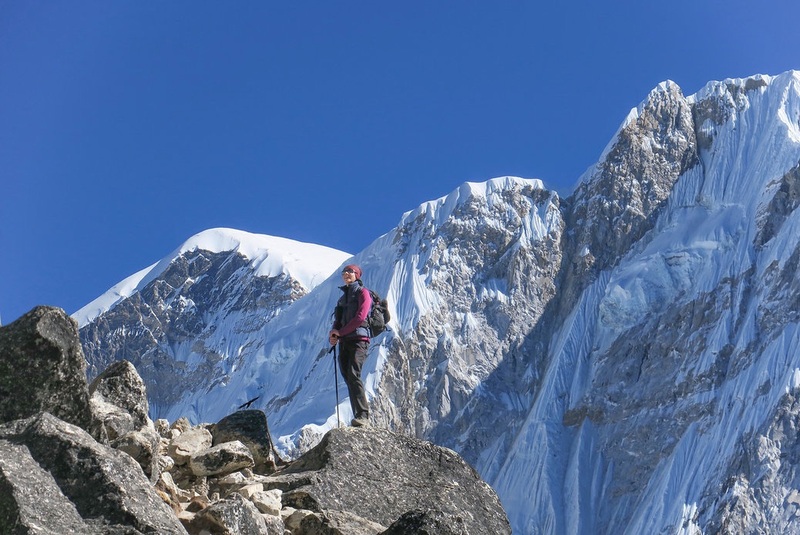 8 Day 8: Rest day at Dingboche for acclimatization and excursion.Another rest day for acclimatization on this high elevation a fine place for leisure hike and walks around where a climb up to a hill offers tremendous scenery of peaks with Mt. Makalu towards east horizon. 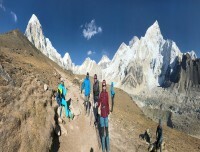 Enjoying scenic excursion with afternoon free to catch up with your dairy and relax marveling the views of Ama Dablam North Face with other giant mountains. 9 Day 9: Trek to Chhukung 4,730 m - 04 hrs.After a pleasant time at Dingboche today a short day to Chhukung leads to you at 4,760 m high, as our route heads further east with gradual walks on huge field of Imjatse valley to reach a small settlement at Chhukung for overnight stops before our tough day to cross the first pass of the adventure. Afternoon relax with views of Island Peak, Lhotse Shar, Lhotse, Nuptse and Amadablam or take a hike up to Chhukung-Ri at 5,100 m high for best views of surrounding landscapes and mountains. 10 Day 10: Cross over Kongma-La 5,535 m and trek to Lobuche 4,930 m - 08 hrs.Starting early morning for the adventure over Kongma-La pass, as walks leads past Chhukung to reach at Bibre in between Dingboche and Chhukung, From here heading into a gully close to Nuptse peak our route leads to seldom ventured areas by trekkers on the off beaten trail' walking over rocks and moraine with climb on top Kongma-la with its close peak with the same name also known as Mehra near Pokalde peaks. 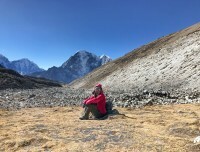 After a good rest on top 5,535 m / 18,159 ft high, where walk leads downhill to Khumbu glacier and over moraine with last final climb to Lobuche for overnight stop in the comfort of several nice lodges with views of Nuptse and Lobuche peaks. 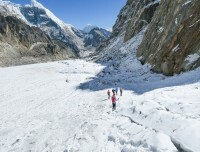 11 Day 11: Trek to Everest Base Camp 5,364 m and return to Gorakshep 5,180 m - 06 hrs.Today walk towards another highlight of the trip to Everest Base Camp, morning walk leads on an open valley a slow climb to reach above Khumbu glaciers, walking past moraine dunes reaching at Gorakshep, a place with few lodges on the junction of Everest base camp and Kalapatthar route. Gorakshep an earlier Everest base camp since 1950’s to late 1970’s before the route further about 4-6 k.m. From Gorakshep few hours walk over moraine and glacier to reach our ultimate destination at base camp with sweeping views of giant peaks of Nuptse-Lo la, Nuptse with notorious huge Khumbu Ice Falls and glaciers. 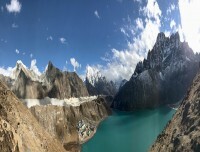 In high mountaineering season this place will be active with climbers and crews with many camps set on top of moraine and glaciers. 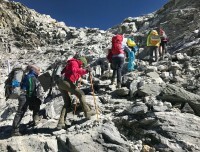 After a grand time then head back to Gorakshep for highest overnight stop of the adventure with fantastic memories of the day walks to Everest base camp. 12 Day 12: Hike to Kalapatthar 5,545 m and walk to Dzongla 4,830 m via Lobuche - 05hrs.Early morning climb on top Kalapatthar a rocky hill at an altitude above 5,545 m, highest spot of the adventure with fantastic panorama of mountains facing Mt. Everest at close distance. After a great moment with excellent views descend back to Gorakshep for breakfast and continue walk to Lobuche, from here downhill to Dzongla a scenic small settlement at the base of Tsho-la (Chop-la) pass. 13 Day 13: Cross over Tsho (Cho) La and trek to Thagnak 4,700 m - 07 hrs.Another exciting day to cross over the second high pass, with early morning climb towards Tsho-la pass or Chola, following a steep path and then crossing a glacier to reach the top of the pass at 5,367 m high, climb can be quite tough and challenging in snow conditions, Tsho-la pass provides views of Cholatse Glacier, after a nice morning with tough climb and rest, then descend to Thagnak also called Dragnak for overnight stop. 14 Day 14: Trek to Gokyo Lake 4,950 m - 04 hrs.Today a short walk to Gokyo Lake walk leads close to Ngozumba glacier and then reaching at first lake, walking further towards second lake and then at third lake known as Gokyo Lake (also called Dudh Pokhari) considered as holy pond by both Hindu and Buddhist, Gokyo an early summer grazing place for Yaks and wild animals with grand views of Mt. Cho Oyo and Gyachung Kang, afternoon free to relax or take a short walks around the lake. 15 Day 15: Rest day with hike to Gokyo-Ri 5,356 m.Morning a climb of few hours to reach our highest point of the adventure on top scenic Gokyo Ri at 5,357 m high offering tremendous panorama from Mt. Cho-Oyu, Mt. Everest, Lhotse and of Mt. Makalu covering four world highest mountains at one glance with series of smaller peaks. Enjoying the views head down to Gokyo for lunch with rest of the afternoon free to realx and preparations for the final last pass of the adventure. 16 Day 16: Cross over Renjo-la 5360m and descend to Lungdhen 4,380m - 07 hrs.Heading towards our last final high pass of the adventure over Renjo-la, morning starts following end of Gokyo Lake, with views of Mt. Everest, Lhotse, Cholatse and Taboche peaks, and then it leads to a strenuous climb to reach on top Renjo La pass at above 5,465 m / 17,929 ft high, at the top with fabolous panorama of Mt. Cho-Oyu and other high peaks. After a refreshing rest then descend to reach a frozen pond below Renjo La pass, and with more downhill to Lungdhen for overnight stop, situated on route Nangpa-la pass which leads to Tibet border. 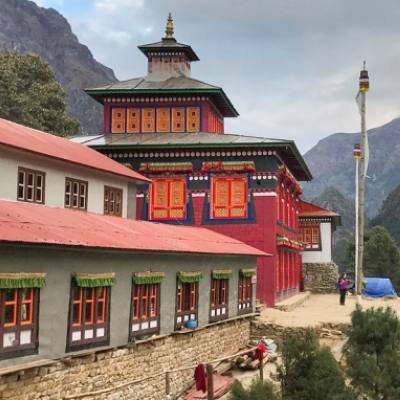 17 Day 17: Trek to Thame 3,880 m - 06 hrs.After a great successful climb and crossing over all three major high passes of Everest within high Khumbu area, morning walk on downhill path to Marlung village and then to Thame village for overnight stop. 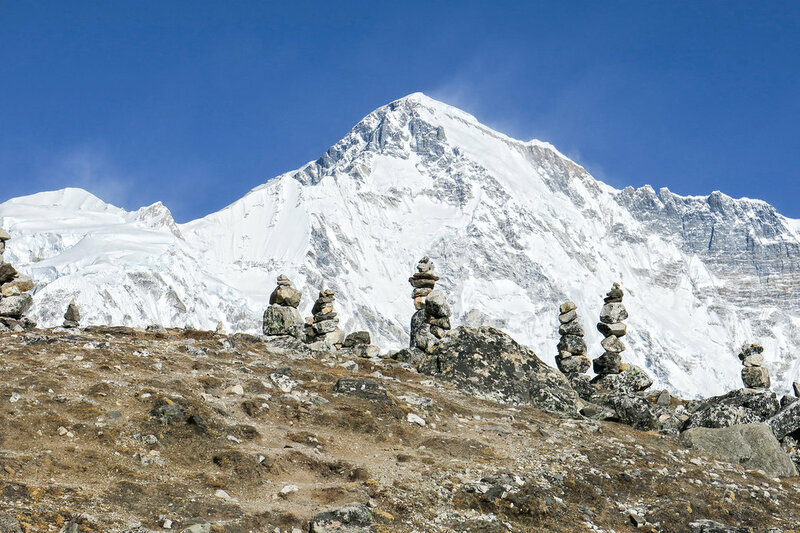 Thame a remote village located west at the end of Khumbu areas of Everest region, here few trekkers seldom visit Thame, only on taking route of Renjo-la or crossing Tashi-Labtsa which is a high pass that separates Rolwaling valley and Khumbu area. At Thame visit Thame monastery, one of the most important and oldest Gompa of more than 500 years old. 18 Day 18: Trek to Monjo 2,860 m via Namche Bazaar - 06 hrs.Morning starts with short descend to Bhote Kosi River and then climb to a ridge, where a pleasant walk leads to Thamo village, from here into cool forested areas of pines-firs and rhododendron trees, then slowly walk leads at Namche Bazaar. From Namche continue afternoon walk downhill to Dudh Kosi River to reach Monjo village for overnight stop before Lukla. 19 Day 19: Trek to Lukla - 04 hrs.Morning with last day trek of this marvelous adventure leads on same scenic trail to Phakding on following Dudh Kosi River downstream, from here a pleasant walk with few short ups and down to Choplung village, where an hour climb brings you back at Lukla for lunch and overnight stop. In Lukla celebrate last night dinner among fellow trekkers, guides and porters after a fantastic time on Three High Passes of Everest trekking. 20 Day 20: Fly to Kathmandu and transfer to your hotels.Morning transfer to Luka air terminal known as Tenzing-Hillary airport, tribute to late legendry mountaineers the first two to conquer on top Mt. Everest. As per the flight time board in small aircraft (Dornier or Twin Otter) a scenic 35 minutes flight brings you to hustle and bustle city life of Kathmandu. 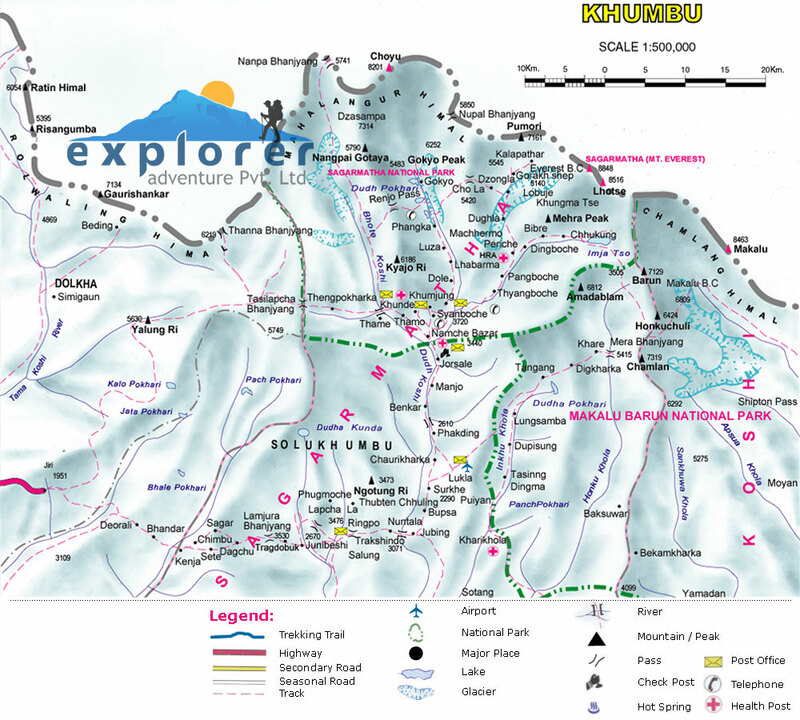 On reaching Kathmandu transfer to your respective hotels with afternoon free at leisure. 21 Day 21: In Kathmandu contingency and free day for individual activities.A spare and contingency day in Kathmandu we have reserved this day in case of flight delay and cancellation at Lukla due to unavoidable conditions like unfavorable bad weather conditions, which is some part of the adventure being in Himalayan region. Well as per the plan with normal flight time, this day to be used for your own individual activities and shopping souvenirs or join in for another exciting tour around Kathmandu-Patan and Bhaktapur for delightful sightseeing tour around world heritage sites and seeing more of Nepalese culture. 22 Day 22: Depart for international flight home ward bound or to respective countries.Last day in the country of high beautiful Himalayas as per your international flight transfer to Kathmandu international airport for homeward bound or to next port of call after a wonderful and mesmerizing adventure on Three High Passes of Everest trekking.